Over the past decade or so I developed and teach a college level course called “The Physics Behind Music.” The course combines my interests in basic science and in music and is intended for students who normally take few science courses as part of their curriculum. To try to make the physics more accessible, there are a large number of in-class demonstrations. Non-linear physics problems are notorious for being very difficult, if not impossible, to solve. There are those who spend their entire careers focused on non-linear physics. At the same time, non-linear physics is all around us and is the key to sound production in all the wind and bowed instruments. Perhaps the most well-known example of non-linear physics is common everyday friction. Friction is the non-linear force which gives rise to the so-called “stick-slip” mechanism when a bow rubs across a string.2 The string sticks to the rosined hairs of the bow. The string is stretched sideways by the bow until the friction can no longer provide enough force to hold it. The string then snaps back and becomes stuck at a different location on the bow. The process repeats giving rise to tone production. The same basic physics can arise as tectonic plates move passed each other and the “snap” is felt as an earthquake. For reed instruments, there is a non-linear interaction involving the reed, which can open and close in response to the local air pressure. For the flute, the physics is sometimes described by referring to the jet of air we blow as an “air reed.” The jet of air moves in and out of the instrument in response to local air flow. To demonstrate the importance of this non-linear physics for musical sound production, I created two new instruments by swapping the head joints between a clarinet and a flute. I call them the clute and the flarinet. The clute has the clarinet up front and a flute body down below; the flarinet has the flute up front and the clarinet body below. The question is, what will they sound like? Is the sound determined more the head joint or more by the body of the instrument? Or will the sound be something in between? than a flute, and the flarinet, though harder to play, sounds like a flute. This tells you that the non-linear physics at the head joint is mostly responsible for the sound of the instrument. Physicists and engineers often use imaginary numbers as a tool to compute and describe results. Imaginary numbers are those which involve the square root of minus one – that is, the number which when multiplied by itself – that is, “squared” – gives you minus one. Since all “real” numbers become positive when squared, the square root of minus one cannot be a real number. Hence, imaginary numbers were “invented” to fill this void. Nothing you can ever measure will be imaginary – by definition – however the mathematics provides a convenient tool for analysis. Imaginary numbers often show up in transmission line theory. When playing, the sound energy inside the flute is much larger than what you hear on the outside. Only a fraction “leaks out.” In the lowest octave, that internal energy is mostly confined between the embouchure hole and the first open hole. The energy bounces back and forth at the speed of sound. When the distance is shorter, you get a faster bounce and a higher pitch. When the distance is longer, the bouncing takes more time and you get a lower pitch. However, in the third octave what happens is not so simple. the flute. You can demonstrate that for yourself. When you play A in the low octave, you can do anything you want with your RH pinky and the sound is unaffected. There is negligible internal sound energy near the far end of the flute, so the keys there have virtually no effect. On the other hand, when you play A in the third octave, the RH pinky can have a big effect, indicating that the internal sound is present the whole length of the flute even though there are many open holes in between. at a “cutoff frequency” where the description of the portion of the flute pipe with open holes changes from imaginary values to real values. The sound does not propagate – it bounces back – when the values are imaginary, but has no trouble traveling right passed the open holes when the value is real. The frequency of the sound is then determined by a complicated collection of several partial reflections along the length and at the end of the flute. All in all, there is a lot of physics behind fluting. Bryan Suits has been a physics professor at Michigan Technological University since 1985. His recent research involves the use of nuclear magnetic resonance techniques to detect explosives. He has also been an avid amateur flutist since he was very young. His first flute lessons were in the home of Mark and Judy Thomas. His later instructors included Penny Fischer and Glennis Stout. 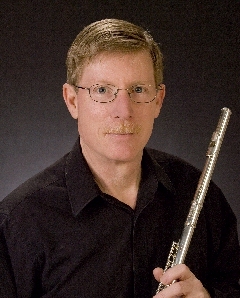 He has been a flutist for the Keweenaw Symphony Orchestra for twenty years.